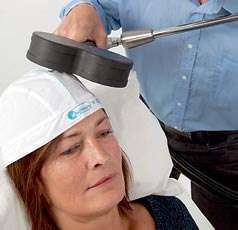 Transcranial Magnetic stimulation rTMS is a procedure in which cerebral electrical activity is influenced by a pulsed magnetic field. The magnetic field is generated by passing brief current pulses through a figure 8 coil. This coil is encased in plastic and is held close to the scalp so that the magnetic field can be focused onto specific areas of the cortex, or surface, of the brain. rTMS therapy was approved by Health Canada for clinical delivery in Canada. 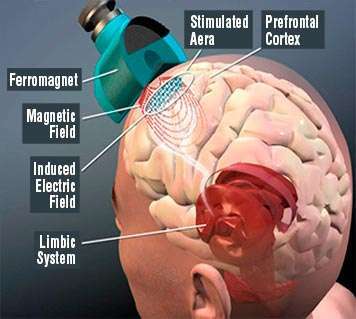 The magnetic field that is generated in rTMS can penetrate the scalp and skull safely and painlessly to induce a current in specific regions of the brain. 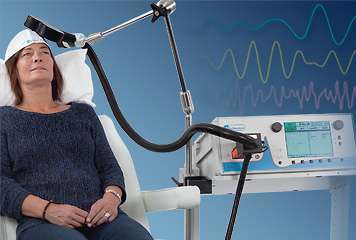 It is termed repetitive TMS, or rTMS, because the magnetic stimulation is delivered at regular intervals. Many aspects of rTMS, referred to as stimulation parameters, can be changed. The ability to change parameters while directly targeting specific brain areas suggests that rTMS has valuable therapeutic potential. In treating depression, rTMS therapy targets the area in the left cerebral hemisphere just a few inches above the temple and beneath the skull. This area is called the left dorsolateral prefrontal cortex (L-DLPFC, see photo). The L-DLPFC is readily accessible to the magnetic field and is highly interconnected with limbic structures, which play a dominant role in mood modulation and major depression. rTMS is used to treat depression by inducing a current in the L-DLPFC with stimulation by a magnetic field. The stimulations are short but intense, lasting less than a millisecond. The penetration itself holds little energy. Several studies have suggested that rTMS regulates beta adreno-receptors and increases dopamine and serotonin levels. Some remote brain structures are also believed to be linked to depression. rTMS may alter activity in these structures not directly accessible to the rTMS coil by focal cortical stimulation. The indirect stimulation occurs via trans-synaptic effects. This means that the accessible areas of the brain, such as the L-DLPFC described above, are first directly stimulated by the magnetic field. This direct stimulation may in turn cause the inaccessible areas of the brain to be stimulated. The human brain is a natural electrical organ that functions by transmitting electrical signals from one nerve cell to another. Brain imaging techniques demonstrate that individuals suffering from depression often display insufficient levels of glucose metabolism, lower blood flow in the L-DLPFC and increased activity in the limbic system. rTMS acts on this process by regulating the flow of interactions between neurons that will appropriately increase or decrease the desired regions to relieve the depression. Acute treatment for depression consists of 20-30 rTMS sessions, over 4-6 consecutive weeks (excluding weekends).